Prepared almost on the same lines as Khichdi, Pulagam is Andhra Khichdi, made with rice and split moong dal. Very simple to prepare and is often made when one is sick or feeling tired. It is also prepared as Naivedyam (prasadam/offering to God) during festivals like Sankranti where fresh or new rice from the harvest is used along with pesara pappu(split yellow moong dal) to prepare it. Quite a few temples, here in Vizag, offer pulagam as Naivedhayam to the presiding deity and distribute to the devotees visiting the temple for darshan. Wash the rice and dal and soak them together in water for 15-20 mts. Meanwhile in a heavy bottomed vessel or pot, heat ghee. Add the cumin seeds, let them splutter and turn slightly brown. Add the curry leaves and black pepper corns and fry for a few seconds. Add the drained rice and dal and combine with spices and fry for a few seconds. Add water and salt and pressure cook till the rice and dal are cooked and soft. Garnish with fried cashwenuts and serve with tomato chutney or avakai. Your pongal looks perfect. I like the idea of adding whole peppercorns as opposed to coarsely powdered. We add grated ginger too, Sailu. Pics are great as usual. Yes, Krithika, I rather add the whole ones than coarsely ground ones. I add grated ginger too at times. One of my friend from Andhra used to make this often. She served this with some tamarind gravy. Unfortunately I had not taken the recipe from her :(. Shilpa, can you describe this tamarind based gravy? Bavundi, both recipe and photos! I remember eating this in AP temples…Isn’t it almost the same as Tamil pongal? Yes, Shynee, its almost the same as Pongal. These photos are just fantastic, so vivid, you have captured the soul of this dish in these photos. Thank you for the recipe, sounds similar to Pongal. Yes, Archana, its very similar to Pongal. Great photos..Reminds me of Sankaranthi festival. Thanks. Loved the way the pics are taken. Cool one Sailu – suddenly after you started ur own site your fotos are all great and everything is more and more beautiful.. Your dedication for the site is showing thro. Good job girl. memu ee recipe ni pongal antamu..and it pairs superbly with tomato thokku. My mom also does a tamarind + green chilli + ginger chutney for this. Thats my No.1 combo 🙂 My mom also adds some ginger and thin slices of coconut to it. Sailu I have also added the Jihva icon for related recipes in my blog, I might also do another one for Jihva..how do I send them to u. Should I pick just one of all the recipes..? and when is the last day to post..? Priya, you should blog amma’s chutney one of these days. Its a request..:). I also add ginger and grated coconut sometimes. I blogged the basic pulagam recipe. There are many variations to it. Priya, you can blog as many recipes as you want for Jihva event. Basically you have to post your recipe on July 1st, that would be the first best option. Otherwise you can blog your recipes for JFI – Dal and link to those posts on July 1st. This looks lovely and delicious — I especially love the bowl it is presented in. This looks like a special bowl — perhaps you’d tell a little about it? It looks like a type of leaf layered inside. I am so glad you asked me about these low- cost, traditional, disposable, natural, eco-friendly, bio-degradable, pollution-free bowls. The leawf plates and bowls are made from leaves which are collected from the forest/hilly areas by local farmers. Two or three leaves are stitched together by hand with thin neem or bamboo sticks to form into a bowl or plate. Beautiful photos Sailu, truly represents the spirit of food in India. Sailu, the gravy had notmal tadka(seasoning with mustard, urad daal etc), then tamarind water. To thicken, my friend used besan water(thats a guess). She served the gravy with khichadi(pulagam). I don’t usually make a dish include lentils/beans… just influenced by my family. But after seeing so many great dishes of yours, I can’t resist! Your lentil rice medley looks absolutely yummy! About those fascinating bowls/plates… perhaps your camera will find one empty sometime? 🙂 Thanks for telling about them. When I was traveling in Bangalore, Hampi etc I ate this for breakfast at small restaurants. It was just delicious. Totally agree with you, Ashwini. Its sad that we are indifferent to our environment and I just hope we learn our lessons and work towards using more of eco friendly products. This is something new to me. It looks excellent. You should try it sometime, Pushpa. Your site always reminds me of motherland. Leaf plates,bowls and ganapathy statue..simply superb. This recipe tastes even better when done with nookalu instead of basmathi rice or sona massori! Your website is great! I am so proud of you for highlighting the virtues of our Andhra cuisine in this public forum. Your photographs and narratives are lovely, and your recipes are right on. Way to go!! I downloaded this recipe yesterday and cooked it today for 20 people(10 cups) in my yoga group. They loved it thanks a lot for the recipe and pictures(which were the real motivating factor). Your site is wonderful. I love the photos. It really helps a non-Indian to know just how to make the dish. I have no young memory of these dishes, and so I have to make it from the point of having never seen it made before. I have three Indian children (two of them from Kerala, and one from Calcutta) and we absolutely LOVE Andhra foods! I spent some time in Vijayawada, and have not been able to replicate the food to my satisfaction. There is something else, something very special that I leave out. Wish I knew what it was! I have always been a silent reader of your blog. Today when I saw Pulagam, I couldn’t resist but drop a comment. My dear grandma makes this everytime for any festival, especially Sankranthi. Its differnet than the one you posted. She just uses moong dal ; rice ; tumeric and salt in pulagam which goes really well with Jaggery, Brinjal chutney, pachi pulusu (tamarind rasam with finely chopped onions and other stuff which is not boiled..need to ask her what else she puts in there), that she serves along. Me and my grandfather love this. Are you able to provide the contact person, address for the lotus leave plate( wholesale). I am interested in importing those plates. I tried this recipe today…for Kichidi…came out really well and it was very fast. Thank you for sharing. this is your new fan hema. i like ur receipes very much, they r very helpful and come out really well. hope u share more new ones. So very satisfying. Oh, the ghee does wonders to the flavor! 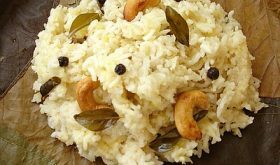 For the sake of completeness, if and when you have the time, could you perhaps blog a pongal recipe that you might have tested and liked Sailu? I didn’t seem to find one here.. I am a new fan of urs. I am not a grt cook but I love cooking .Tried many of ur recipes n they came out very well . Mee valla mana vyzag peru motham prapanchaniki telisindi. Keep it up. First of allll andariki sankranthi suhakankshalu……..
i would like to try every our festival do somthing special item with my mom……. deeni valla maaku new items cheyadaniki simple and help gaa vundi,,,, anduloni mana vizag nunchi…. chaala santhosam ga vundi……… keep continue……..
What’s the water qty to be added while pressure cooking ?